Matt Kemp isn’t asking the Dodgers to trade him. But he isn’t necessarily opposed to the idea, either. The outfielder’s agent, former major-league pitcher Dave Stewart, told FOX Sports on Wednesday that Kemp again wants to be an everyday center fielder, something that isn’t in his immediate future with the Dodgers. Kemp, 29, is again an intriguing figure as the July 31 non-waiver deadline approaches. Since May 2, he has raised his batting average from .205 to .269 and his OPS from .736 to .760. He also has started 40 of the Dodgers’ last 42 games in left field. The Dodgers are pondering whether to add insurance for their rotation in addition to an upgrade to their their bullpen. General manager Ned Colletti, however, declined comment on whether the team would be willing to move Kemp. One likely deterrent: Yasiel Puig would be the Dodgers’ main right-handed power threat if they traded Kemp and then Hanley Ramirez left as a free agent at the end of the season. And even Puig, in his last 41 games, has produced a .391 slugging percentage — modest by his standards. But now, with the return of Carl Crawford from a sprained left ankle last Thursday, the Dodgers again must deal with five healthy outfielders —Crawford, Kemp, Puig, Andre Ethier and Scott Van Slyke — for three spots. Ethier and Van Slyke are starting most games in center, a position that Kemp has played infrequently since moving to left on May 28. Kemp, coming off ankle and shoulder surgeries, was well below-average in center prior to the change, according to advanced metrics. Joc Pederson, who hit a home run in the Triple-A All-Star game on Wednesday night, is the team’s center fielder of the future. But Pederson — like infielder Corey Seager, the Dodgers’ other top position prospect — is a left-handed hitter. 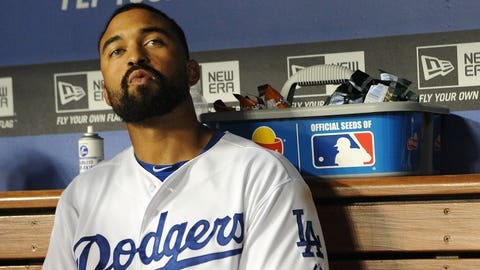 Kemp is still trying to regain his power and first-step quickness, and the remaining $107 million on his contract from 2015 to ’19 would make him something of a risk for any team that acquired him. The Dodgers, though, could include cash to facilitate a deal, and prospective suitors might see Kemp as a worthy bounce-back candidate as he gets further removed from his past physical issues. Both the Mariners and Red Sox expressed interest in Kemp last offseason, but the Dodgers declined to trade him then with his value at a low point. The Red Sox scouted the Dodgers recently, according to major-league sources, but it’s not known whether they were looking at Kemp or other players.